NHM notches new sales ! NHM releases new products ! 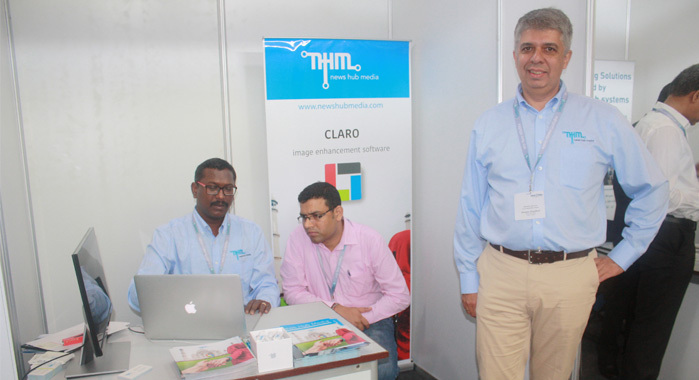 News Hub Media, an industry leader and software developer for design production automation and digital asset management systems, announces Organización Editorial Mexicana, also known as OEM, has selected Claro https://www.newshubmedia.com/claro for their print and web image-processing workflows. As the largest Mexican print media company and the largest newspaper company in Latin America, OEM needed to streamline its image processing without sacrificing quality. By using Claro, OEM was able to improve its workflow efficiency while achieving a dramatic increase in image quality for both its newspapers and websites. OEM is the largest print media company in Mexico and the largest newspaper company in Latin America. The company owns a large newswire service, 70 Mexican daily newspapers, 24 radio stations and 44 websites. The daily circulation of the print edition of La Prensa, OEM's largest circulation newspaper, is more than 450,000 readers. NHM creates and delivers affordable, innovative systems to establish and enhance automation and efficiency in publishing and media with operations in the Americas, Europe, Middle East and Asia. From the largest newspaper group in the USA to hyper local, weekly newspapers and for magazine publishers, web printers and digital press operations, NHM provides comprehensive personalized services to their customers across the globe. News Hub Media, an industry leader and software developer, announces Community Impact will use NHM Suite https://www.newshubmedia.com/suite for their print and web CMS editorial publishing needs. Community Impact’s multiple locations will take advantage of the centralized web based interface for creating and editing their stories for multi-channel publishing. Using a configurable status driven workflow, stories will be automatically positioned into templates for the page designers to save valuable time and permitting them to enhance the look and feel of the publication in confidence of meeting the needs of their time sensitive publishing. Without missing a step, they will be able to publish their content to their newsletters, websites and print publication in any order desired. Community Impact’s growth in the micro-niche newspaper publishing industry demonstrates their keen focus on choice of efficient and flexible systems to rely upon. Having recently won the best non-daily newspaper website in the industry from E & P, they will benefit from NHM Suite to further grow upon this impressive achievement. Community Impact has also expanded on their NHM production tools with the addition of NHM Automator Ad Preprocessing for automated advertisement preflight and fixing. Automator Ad Preprocessing will also parse their ad bookings and transmit them to NHM Suite for auto placement of the ads after they have been properly preflighted and corrected for common prepress issues. NHM WebImposer, used with our standard Automator, and ColorSaver (NHM ink savings software) have been in use since June, 2016 by Community Impact commencing with the launch of their state of the art print facility in Pflugerville, Texas. NHM creates and delivers affordable, innovative systems to establish and enhance automation and efficiency in publishing and media with operations in the Americas, Europe, Middle East and Asia. From the largest newspaper group in the USA to hyper local, weekly newspapers and from magazine publishers, web printers and digital press operations, NHM provides comprehensive personalized services to their customers across the globe. PLYMOUTH, MI - News Hub Media notches new sales for WebImposer with the Dominion Post in WV, and Linco Printing in NY. Our best in class Page Pairing engine, that incorporates the functionalities that other competing systems require separate software vendors to achieve the same. WebImposer handles preflight checking, prepress fixing, page resizing, web growth, softproofing, approval, page pairing, output management and third party deliveries in one unified system. It is our goal to always keep up engineering and innovation in all our products, including our legacy software line. We are proud that customers continue to see value in the continuous improvement we invest into our long standing newspaper output management suite of products: WebImposer, Automator and ColorSaver. NHM creates and delivers affordable, innovative systems to establish and enhance automation and efficiency in publishing and media with operations in the Americas, Europe, Middle East and Asia. From the largest newspaper group in the USA to hyper-local, weekly newspapers and from magazine publishers and printers to one of the largest automated digital print production facilities in North America. GoMediaHub: A complete Pre-media services management system. The only system that optimizes connectivity between your customers, your sales, their media files and your production systems. Self updating and cloud distributed, desktop clients, mobile clients, and Adobe plugins. Highly scalable and disaster proof architecture. Custom Job Submission Forms creator for customer specific needs. Activity tracking and time clock systems integration. Can automate any tool, and optimize any employee or contractor. Realtime metrics dashboard and reports. Works with identity management systems such as Okta. Works with all digital and print media formats (images, logos, ads, videos, etc.). No limitations on number of users or files. Ark: A Digital Asset Management (DAM) system made for publishers. Ability to catalog and index native Adobe InDesign packages (including links, native files, and fonts) as a single asset. Ability to catalog and index generic HTML digital ads, and native Adobe Edge / Animate, HTML packages, as a single asset. By Rahul Kumar — September 06, 2017 — At the show, News Hub Media will showcase the new cloud solution versions of its editorial system suite and or digital asset management system ARK. “Taking the already successful editorial and DAM systems in to the cloud allows full flexibility for publishers,” said Ramsay McAllan of News Hub Media, adding that cloud solutions is the future for the company’s solutions and it will present this at the show, together with its diverse solution portfolio complimenting every aspect of the publishing process. The company will also promote Automator Version 5.5, its latest prefilght and file normalisation software while complements its other production solutions such as solutions for automated page pairing, automated image enhancement and ink saving. While the company is targeting newspaper publishers, McAllan said magazine publishers also are of a key interest. “Our solution portfolio has offerings for both sectors. Furthermore, our solutions cater for large and small publishers meaning all visitors, including printers and agencies would benefit from viewing our solution line up,” he added. McAllan said NHM views India as a unique market quite unlike any others. “NHM is bringing new solutions to the Indian publishing and printing industry and the trend that we are seeing is that the forward thinking publishers have a hunger for newer technology that surpasses the technology of before, and as a result, we are engaging more and more with newspaper and magazine publishers and being requested to ‘show them something new’,” he added. The company wants to build on our existing Indian client base at the show, while at the same time having exposure to key Industry decision-makers. McAllan said the company also look to connect with new regional channel partners and develop new business relationships with industry experienced partners. Novi, Michigan — July 10, 2017 — News Hub Media (NHM), a leading global provider of content publishing software and software-enabled services, is excited to announce that it has signed a lease to move its North American headquarters to new, larger offices on August 1, 2017. The new location in Plymouth, MI will accommodate the organization’s continued growth and evolution in software development as well as supporting the ongoing global sales and marketing operations. News Hub Media’s innovative software enables publishing across the globe. From the largest newspaper group in the USA to hyper-local, weekly newspapers and from magazine publishers and printers to one of the largest automated digital print production facilities in North America, NHM is focused on creating affordable, innovative systems to enhance automation and efficiency in the industry. NHM, previously PuzzleFlow Solutions US, has been located in Novi, MI since its inception in 2007 and operates offices in Latin America, Europe and Asia and Australasia. NOVI, Michigan — February 13, 2017 — News Hub Media (NHM) announced today that WebPairer has been renamed WebImposer. The name change is part of the company’s rebranding strategy and better reflects the product’s purpose. WebImposer is an intelligent production management and automation system that enables the dynamic pairing of pages without the need for numerous templates. Additionally, WebImposer provides industry standard preflighting, hard and soft-proofing and automated file distribution. “WebImposer adopts industry terminology that is easily recognized throughout the global web offset market,” said Richard Laframboise, President, NHM. “The renaming speaks to the product’s functionality and worldwide opportunities.”. NHM offers a full range of software products: SUITE (multi-channel editorial workflow), ARK (digital asset management), WEBIMPOSER (page pairing workflow + more), AUTOMATOR (page and ad preflighting and prefixing), CLARO (automated image enhancement), COLORSAVER (mobile friendly PDF transformation). NHM creates and delivers affordable, innovative systems to establish and enhance automation and efficiency in publishing and media with operations in the Americas, Europe, Middle East and Asia.